One of the greatest places that I have discovered in my many explorations in Richmond, Virginia is in Oregon Hill—the famous Hollywood Cemetery. Hollywood Cemetery is the final resting place of many famous people. There are presidents, generals, soldiers, historians, and governors buried there, and even a few children and small family pets. One of the greatest urban legends in Richmond stems from this cemetery, the story of the Richmond Vampire. However, there is another one: the tale of the cast iron dog. Hollywood Cemetery is one of the most popular places to visit in Richmond. I have been here quite a few times since I first moved here, almost six months ago. Hollywood opened in 1849 and is on over 135 acres of land. People are still being buried there today, but it has an incredible historic background as far as its inhabitants go. In the 1860’s, it is said that there was a young girl who would walk by a store on Broad Street every day. There was a cast iron dog outside of the store that she loved. It was rumored that she would pet the dog, hug it, and even talk to it as she would pass by. She treated the cast iron dog as if it were real and some say she genuinely did love this dog made of iron. The little girl died when she was two or three years old (stories say both) of scarlet fever. Most of the stories in Richmond history say that the dog was placed by her gravesite in Hollywood Cemetery by the store owners. They knew how much she loved the dog. The store owners thought that it was only appropriate for the dog that she loved so much to guard and protect her at her final resting place. At the time, there was a shortage of iron so this was considered quite the grand gesture. The legend is that the dog protects the little girl and watches her grave. There have been many people who have said that they have seen the dog's eyes watch them as they get closer to the site. Many have even claimed that they have seen it change position. 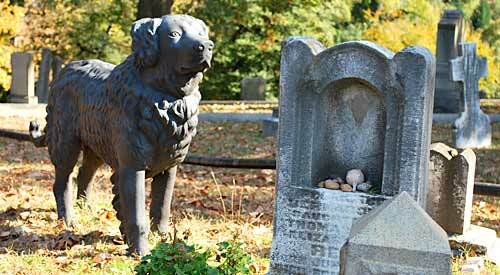 There have also been a few folks that have heard it barking at night and even seen it walking around the cemetery. Perhaps all of these stories are true or they're all elaborate tales to help further protect the little girl’s grave. One thing is for sure, the dog and its many tales have definitely caused quite a stir. Check out Quail Bell's documentary on Richmond's cemetery, Richmond's Dead and Buried.